According to the University of Florida IFAS Extension, botanists have identified over 1,000 different species of begonia plants. Flower enthusiasts grow begonias for their attractive blossoms as well as their decorative foliage. The size, type of foliage and kind of flower varies depending upon individual species and cultivars. Some varieties such as the Rex cultivar are grown specifically for their ornamental foliage, while others such as tuberous begonias are valued for their large blossoms that occur in a wide range of colors such as yellow, pink, red, orange and white. Hardy begonias grow to be 2 or 3 feet tall; they have large heart-shaped leaves and small pink blossoms. Many other species and cultivars are also commercially available. According to the Clemson University Cooperative Extension, begonias work well in small flower beds because they do not grow out of bounds. 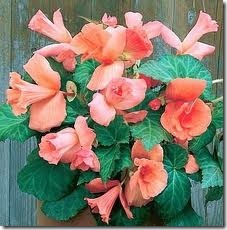 Begonias also make attractive potted or hanging plants. They prefer bright sunlight and moist, well-drained, nutrient-rich soil with light to moderate amounts of fertilizer. Begonias are susceptible to a variety of problems. The botrytis blight pathogen creates leaf spots and covers leaves in grayish-green fungal growth, while Xanthomonas leaf spot destroys leaf edges. Other problems include foliage-feeding insects such as caterpillars, aphids, gnats and thrips.